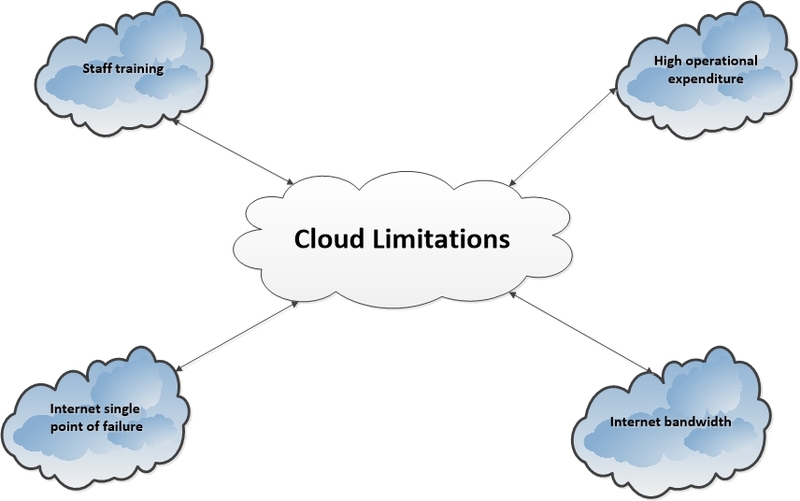 What do we mean when we say Cloud? 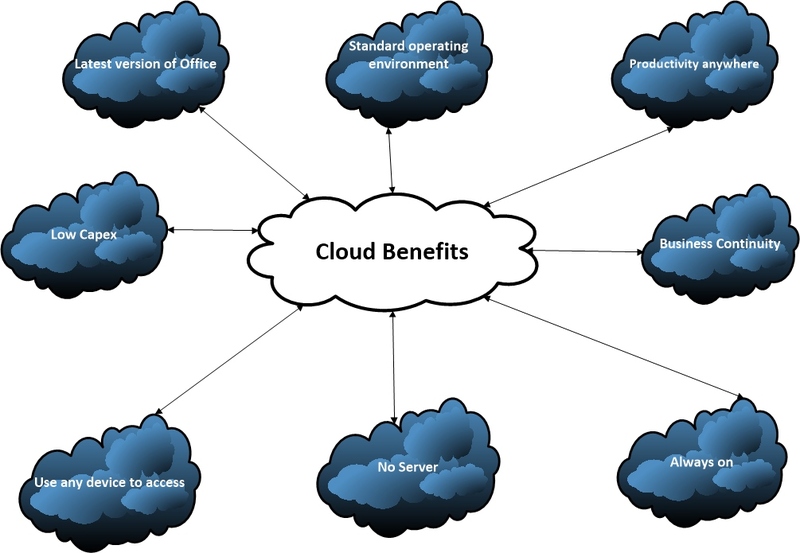 Simply put Cloud is a way of enabling your company to run all of the business applications your staff use over an internet connection. You can do this from the office, at home, on the road and from overseas. By utilising Microsoft’s Remote Desktop Services/Session (RDS) a short cut will be installed on every staff members PC which when clicked on will log them into the company’s corporate environment. This can be installed on PCs, MACs and Laptops. There are also apps available for tablets/mobile phones. Nothing is stored at the PC level, everything is stored on a Server in a Perth Datacentre in Austin Technology’s Cloud. 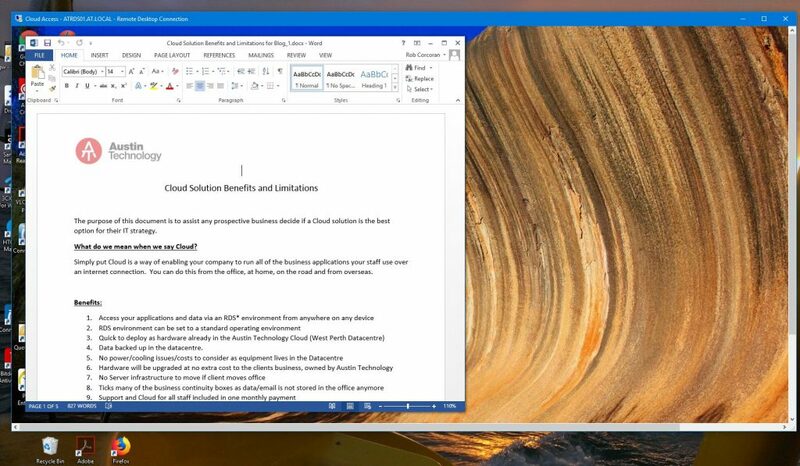 Your virtual desktop in a window on your PC. Data backed up in the datacentre. Internet speeds must be closely monitored to ensure there is enough bandwidth at the main office to support every Cloud user logging in. On a poor or over-subscribed internet connection the end users can suffer from drop outs and slowness. ADSL type connection is ok for 1 or 2 people, 4G depends on many variables as its speed changes all the time. Some users may have difficulty adapting to an RDS session if they are used to working locally i.e. locally installed applications on the PC and shared folders that appear on the PC. No Internet = no access to data, email etc. An NBN connection or 4G backup router from Telstra, Optus, etc. can mitigate this risk. A Virtual Private Tunnel will be installed from the main office to the Virtual Server hosting your IT infrastructure in the Datacentre. Users who work remotely or from home will have a similar connection installed on their PC’s/Laptops. Each user will need to enter a password to connect to their Cloud user account that will have a set complexity, monthly change and a set number of login attempts before account lock out to prevent any brute force type of attack. We can also add two factor authentication for every Cloud login, meaning via an app on your phone to give you an additional one time use passcode in addition to your existing password. Our cloud backups are completed on to a Storage area network or SAN for short, which includes granular hourly recovery. We take an hourly reference point so we can recover very quickly to any point in the last 24 hours. On top of that we have an additional offsite backups (from the actual Datacentre) completed daily. Standard retention period (how long we keep a backup before overwriting) is 40 days and 7 days for the offsite backups. Third party providers such as Myob, Xero, Quickbooks etc. (and many, many others) all offer products that leverages their own Cloud. This means of staff using a database that resides on the server in the office (or Cloud) they access a database that resides on the third party providers Cloud based servers. While this can often be a good idea we much keep in mind that all these different apps will use part of the businesses office internet connection to operate, just depends on how many staff will be using x number of applications concurrently. An RDS environment uses the available bandwidth much more efficiently over the company’s internet connection and will also provide a standard operating environment for all applications, for all staff members. Depending on the scale of the business and staff numbers we may recommend a “point to point” connection from the business office to our Cloud. This mean a dedicated connection that connects from your office directly into our equipment in our Perth Datacentre. In order to reduce any disruption to your operations we employ a phased project approach. Once the company’s infrastructure is understood and testing of any historical applications within a Cloud server including cloud based email, we would proceed to migrating the companies email for all staff to Office 365 email. By leveraging Microsoft’s own Cloud that has Office 365 email deployed we can quickly and efficiently move all staff email accounts with zero down time to the business. There would be a cut over point, meaning a set day and time within the project plan agreed with the business to switch to the new email system. Outlook will then be able to auto discover the new system and mobile devices will updated similarly. In addition our engineers will be on hand to assist any staff at any point. As the existing infrastructure is still running in the background the rest of the business applications and data will remain unaffected. 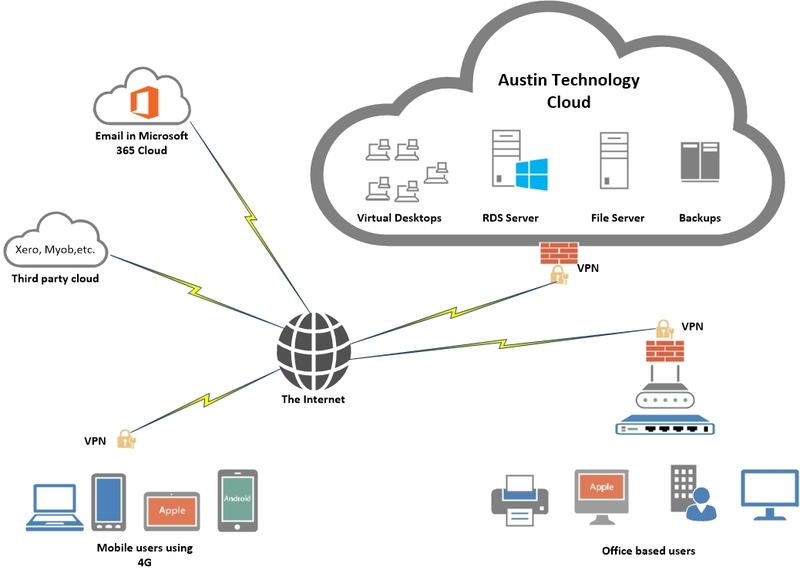 Once it is confirmed that email is running smoothly, now we can spin up the virtual servers within the Austin Cloud. This will consist of Active Directory and the RDS its self, we may need an SQL Server depending on any existing applications that require SQL. Again the business will continue to operate as normal while we build the new Cloud infrastructure until the final cutover point agreed with the business. Multiple power redundancies, battery, diesel power etc. Thank you for taking the time to read our blog. Austin Technology provides businesses in Australia with Cloud Services and ongoing technical support since 2012. If you’re ready to start enjoying a new era of collaboration and enhanced productivity, talk to one of our experts today. Next Austin Technology’s Top Programs for your Business.